This simple and easy to put together Rustic Chic Fall Mantle has me dreaming of cooler fall days and pumpkin EVERYTHING! One of the things I regret most about our current house, is a lack of fireplace! Gas or wood it wouldn’t matter, as long as I had a mantle to decorate for every season and holiday! There is something about the change from summer into fall that makes me get all “nest-ish” and homey. All I want to do is sew quilts, decorate my home in pumpkins, and snuggle for days on end! I’m using this Rustic Chic Fall Mantle idea as a way to try and convince my hubby that we NEED a fire place! This list contains affiliate links. If it helps you, it helps me too! 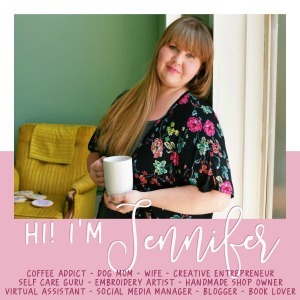 BusyBeingJennifer.com gets a small commission when you buy through them, and it doesn’t cost you anything extra! I’m currently contemplating switching around the living room/dining room and getting one of those faux fireplaces and building a mantle around it, but I’m not having much luck convincing the husband. I on the other hand think its a FANTASTIC idea! And I am just itching to move furniture around and build a mantle. The Rustic Chic Fall Mantle I’ve been dreaming about, come to life! I need this Fall Decor!!! I want to create a rustic chic fall mantle just like this!! Maybe if I am really sweet, and extra nice, and make his favorite meals, I can convince the hubby in the next week or 2 that I’m brilliant and he needs to help me. Mayyybbbeeee. I usually decorate the top of of our upright piano as a mantel.